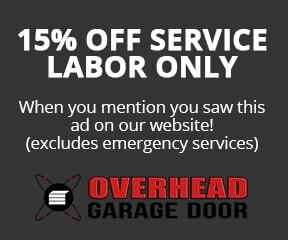 7 Reasons Your Garage Door Won't Open - Overhead Garage Door, Inc. Imagine pulling into your driveway with a trunk full of cold groceries and your garage door won’t open. Now you have to park and carry them all to another door to your house. It can be a hassle. There’s no telling how long your door will be out of commision or how much it’s going to cost to fix it. It’s important to identify the issue and see if you can fix it yourself, or if it’s time to bring in the professionals. Here are seven common reasons why your garage door won’t open and ways to fix it. Today’s garage doors come complete with a photo eye. It can detect if there is a person or thing blocking the door if so, it prevents it from shutting all the way. It’s 4-6 inches off the ground on most doors and is the size of a pea. It’s possible that this problem is an easy fix. You can check and see if the cord attached to the eye is cut or damaged. Sometimes a rainstorm or a leak can damage the eye as well. Dust and dirt can clog the eye up and block the laser beam that sends out the signal. When this happens, cleaning it with a cloth may solve your issue. Speaking of something being blocked, another thing that can cause your door not to open is if your power source is disrupted. Sometimes out of pure absentmindedness people will unplug their power source and forget to plug it back in. Check and make sure that your garage door opener is plugged into a working outlet. There are times when outlets just go, you can’t control that. Plug in another electronic device into it to see if it just stopped working. Also, check your fuse or circuit breaker. This is just a minor issue. What you don’t want is your spring or cables snapping. If the garage door isn’t opening but the motor is running, the problem might be the springs in the garage door assembly. This is a very common issue. In each assembly, the door will be guided by a few torsion springs that run horizontally over the width of the door and by two extension strings that lift and lower the door along the tracks. Springs work in cycles and once they have exhausted these cycles they will inevitably break. The good news is that if this is the problem, you’ll know it. It lets off a loud, firecracker-like sound. Unless you’re not at home, you can’t miss it. You know how some things have a domino effect right? This is the case when it comes to your torsion springs and other cables. When the torsion springs break, other cables break right along with it. The cable breaking can cause serious damage to your car or wall. It will be even more tragic if someone is standing nearby when it happens. You’ll need to call a repair technician right away if you’re dealing with a broken cable. Going back to minor issues that you can fix yourself, sometimes your sensitivity is just off. This is a common issue in newly installed doors and old. If the sensitivity is set too low or high, the garage door won’t open. The good news is, this is an easy fix. You just need to read the manufacturers guide to find out how to reset the sensitivity. You can adjust the close force and limit switch to the correct levels and then you should be good. If your garage door won’t open when you use the remote control, there are a couple reasons for that. You could be out of range, so the sensor can’t read what you’re pressing. The antenna on the motor could be damaged or blocked from the signal. You have to make sure it’s dangling from the motor. Check and see if the door will open with the wall switch. If it does, then simply changing the batteries in your remote should get it up and working again. If all these troubleshooting steps fail, you will most likely have to reprogram your remote. If the door is off its track it’s obviously not going to slide properly. Make sure that the door is rolling smoothly along its metal track. Check the track for any little bends, bumps, gaps, or obstacles. Listen out for any squeaks and watch out for any signs of friction. Does the door get stuck or slow down when it’s trying to work? If this is the case, chances are it’s misaligned. You can actually fix this problem yourself. Loosen the screws that hold the track to the frame, gently tap the track back into place, tighten the screws back, and Presto! There are many reasons your garage door won’t open. It could be as simple as the door being off track, the photo-eye being blocked or dirty, or the remote control malfunctioning. It could also be a worst case scenario like the springs breaking, and the cables snapping. Determine what it is, and if you have to, call in a professional to fix the issue. If you want to install a garage door or if you just need yours repaired, contact us to get started.